Whether you’re a beginner or professional there’s something for you with the Roland RP102 Digital Piano. 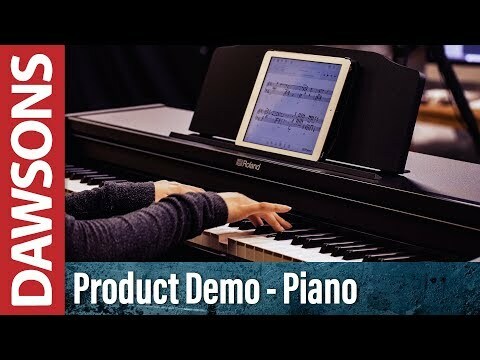 Featuring the SuperNATURL Piano engine and Ivory PHA-4 Keyboard, the piano sounds and feels the part, while the bluetooth and USB connectivity make it an ideal controller and instrument to use with apps. Blurring the lines between digital and acoustic the SuperNATURAL Piano engine brings the expressive tonal nuances of an acoustic concert grand to the Roland RP102 Digital Piano by combining the best of the V-Piano and 88-key stereo multisampling. Not happy with just sounding like an acoustic piano the Roland RP102 Digital Piano features Roland’s Ivory Feel PHA-4 Keyboard, to give you the texture and look of a flagship acoustic. With its advanced sensor technology the keyboard gives you real response and expression. The Roland RP102 Digital Piano is a great piano to learn on, stacked full of learner-friendly functions. To start with the Twin Piano feature allows you to split the keyboard into two, with both sides covering the same octaves, along with splitting the right and left pedals into separate damper pedals This function makes it easier for a student to sit alongside a teacher and see and hear exactly what they need to learn. With its built-in metronome the Roland RP102 will keep you in time, whilst the recorder will allow you to record and listen back to your performance to hear how you’re doing. The Roland RP102 has classical piano etudes included in its arsenal of built-in songs, which are brilliant for practising along to. Alternatively you can connect via Bluetooth wireless technology and play along with a plethora of music provided from the many Roland apps. The Roland RP102 Digital Piano has a number of sound options that will suit any circumstance. You can use the built-in speakers sound, hook up to an external speaker for amplified sound or plug a pair of headphones to isolate the sound for practice. The perfect digital piano for your home, the Roland RP102 Digital Piano will encourage newer players whilst impressing the most particular of pianists.